You can travel to exotic locales or indulge in choice hotels and meals - and still not break the bank. Our complete guide shows you how. WHY IT'S A DEAL Minneapolis offers cosmopolitan allure at reasonable prices and is ideal for a weekend vacation. More than $300 million in new buildings designed by A-list "starchitects" opened this summer, a bonanza that has the cognoscenti buzzing. Yet, in this Midwestern city, the hip and homey coexist comfortably - you'll never meet friendlier waitresses or garage attendants - and with a little care, you can stay on budget. HOW TO GET THERE Several airlines offer flights from Logan to the Minneapolis-St. Paul International Airport for about $250 round trip, though the price can drop below $200. From the airport, take the light-rail line into downtown Minneapolis; the 25-minute ride is $2 at rush hour and $1.50 at other times. Once you're downtown, taxi rides are generally short and sweet, but you'll need phone to summon a cab. If you rent a car, parking meters are plentiful and garage prices are generally reasonable. The gridded streets are easier to navigate than Boston's jumbled byways, but word to the directionally challenged: Don't confuse the numbered streets and avenues. Downtown Minneapolis is also surprisingly walkable, even in frigid months, thanks to the skyway. This system of elevated, climate-controlled walkways connects buildings across roughly 80 city blocks. WHERE TO STAY Hotel rates in Minneapolis dip on weekends when business travelers leave town. So double rooms at the Best Western Normandy Inn (612-370-1400, www.bestwestern.com) can be in the $100 range per night on weekends. Want to splurge? Consider the Graves 601 Hotel (866-523-1100, graves601hotel.com), with its modern decor, luxury beds, and plasma-screen televisions in every room. Normally $259 or more on weeknights, a king (double) room is $199 on weekends. WHAT TO DO Take a tour of the city's newly unveiled architectural masterpieces. 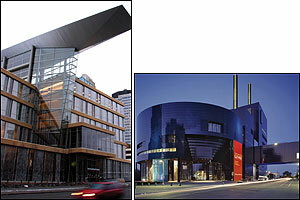 Most, like the Guthrie Theater, can be visited for free. Minneapolis is justifiably proud of the Guthrie (612-377-2224, guthrietheater.org), a stunner on the banks of the Mississippi River. Designed by French architect Jean Nouvel, it features a shimmering indigo-blue exterior and boxy shapes that mimic the nearby flour mills. Don't miss the "Endless Bridge," a cantilevered walkway that extends 178 feet, offering dramatic views of the Mississippi's St. Anthony Falls. The Minneapolis Central Library (612-630-6000, mpls.lib.mn.us/central.asp), designed by architect Cesar Pelli, tops honey-colored limestone and a soaring five-story atrium with angular steel that resembles a massive airplane wing or an open book. Windows on the upper floors offer peeks at the library's "green" roof, 18,560 square feet of hardy plants cultivated to prevent storm-water runoff and conserve energy. And even if your teenage years are a distant memory, stop by "Teen Central" to admire the curvy red bookcases made of Japanese ash. Other Minneapolis highlights include the giant metal cube added to the Walker Art Center (612-375-7600, walkerart.org) by Swiss architects Jacques Herzog and Pierre de Meuron, masterminds behind the Tate Modern in London, and the new wing of the Minneapolis Institute of Arts (888-642-2787, artsmia.org) created by Michael Graves, a favorite designer of the hometown Target Corp.
Take a break with affordable pampering at the Aveda Institute (612-331-1400, aveda.com), located near the University of Minnesota. The Minneapolis-based company trains student aestheticians here, giving you the chance to sample stress-busting treatments at reduced prices. Get an Elemental Nature facial for $40 or a 60-minute foot reflexology treatment for $44. Call to schedule appointments a few weeks before you leave home; they're snatched up quickly. WHERE TO EAT The Minneapolis combination of hip and homey is particularly evident at Bryant-Lake Bowl (612-825-3737, bryantlakebowl.com), located in the popular Uptown neighborhood. Hit the lanes at this retro bowling alley, then dine on well-priced dishes that will warm a foodie's heart. Offerings include an artisanal cheese plate with bounty from nearby Wisconsin, a seared sesame-crusted ahi tuna and seaweed salad, an organic bison salad, and an impressive wine and beer list. The Bryant-Lake Bowl's Cheap Date Night on Mondays is a neighborhood highlight: Get two entrees, a bottle of wine, and two rounds of bowling for $28. For inexpensive ethnic fare, try Nicollet Avenue just south of Grant Street, an area known as "Eat Street." These blocks are crammed with restaurants offering Indian, Vietnamese, Greek, Mexican, and East African cuisine. - E.O. WHY IT'S A DEAL Maine's miles of jagged coastline, where long inlets form sheltered bays, is tailor-made for sailing: Anchor in a pristine cove, hike on an unspoiled island, and sleep with a lighthouse beacon as your nightlight. But most people don't have the requisite experience to charter and man a sailboat. A value-oriented alternative is to cruise aboard those ships of yesteryear that ply the mid-Maine coast, the windjammers. The 14 ships in the Maine Windjammer Association are offering more than two dozen two- to six-day cruises from now until mid-October. Autumn features strong sailing breezes, great foliage, and some of the lowest rates, averaging $140 per person per day, including berth, food, and activities. HOW TO GET THERE The windjammers operate out of Rockland, Rockport, and Camden, a 31/2- to 4-hour drive from Boston. Take Interstate 95 north to Interstate 295, outside of Portland. Follow I-295 until you reach Exit 28 and Route 1 north. Follow Route 1 north up the coast. WHERE TO STAY It's hard to go wrong with any of these historic vessels, and each has a story to tell. Built in 1882, Grace Bailey sailed to the West Indies in the fruit trade and carried granite to New York to help build Grand Central Station. In 1990, Captain Ray Williamson gutted and completely rehabbed the boat. Victory Chimes was built in 1900 in Bethel, Delaware, to carry lumber within Chesapeake Bay. Today, it's believed to be the only remaining three-masted schooner on the East Coast. American Eagle was built in 1930 as part of the Gloucester fishing fleet. It was revamped in 1984 and, along with Grace Bailey, Victory Chimes, J. & E. Riggin, Lewis R. French, Stephen Taber, Mercantile, and Isaac H. Evans, is a National Historic Landmark. On all, sleeping cabins are simple. Special trips this fall include Timberwind's 75th Birthday Cruise (October 2-5), Stephen Taber's Fall Colors Cruise (October 10-14), and the Harvest Moon Cruises aboard American Eagle, Mercantile, Grace Bailey, and Lewis R. French, sailing under a full moon on October 6. For more information, contact the Maine Windjammer Association at 800-807-9463 or visit sailmainecoast.com. WHAT TO DO Remember, this is a windjammer cruise, not a Windstar. You won't be tanning on a chaise longue sipping martinis. While you can just sit and relax and read, guests are encouraged to participate in all work. When the captain cries "Heave-ho!" all hands on deck can pull on the thick rope to hoist the sail. You can also help in the galley and man the helm. You'll be boating in Penobscot Bay, past islands crowned with pines and rimmed with granite. Rarely will you see another boat this time of year, except for the lone lobsterman picking up his traps. There are more than 30 lighthouses in the windjammers' cruising grounds, including Pemaquid Point Light, showcased on the back of the Maine quarter, and Saddleback Ledge Light. 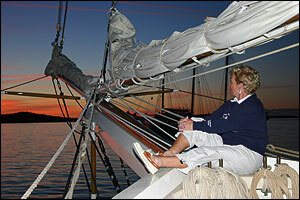 The boats spend the night at anchor - anywhere from Boothbay Harbor to Bar Harbor - and at that time you may go ashore. Longer trips may include a stop under the cliffs of Acadia National Park. WHERE TO EAT A day of salt air and pulling on ropes can build up an appetite. Fortunately, the windjammers are known for their hearty meals cooked aboard and served family style. And if you're expecting Navy grub, you'll be surprised to know that windjammer food is so cherished that no less than six of the boats have already published their own cookbooks. The latest, At Home, at Sea, by Anne Mahle, chef and cocaptain of the J. & E. Riggin, has been featured on the Today show. The fare includes seafood, chowders, salads, and fresh-baked breads. Many of the cruises feature a beach feast with all the steamed lobsters and corn on the cob you can eat. Captain Barry King of the Mary Day once had one young man eat 13 lobsters in one sitting. Talk about getting your money's worth! - S.J. WHY IT'S A DEAL Exotic, colorful, friendly Tunisia in north Africa is a magnet for European travelers, but most Americans have never thought of it for a vacation. The country offers pristine beaches, Roman ruins, the Sahara Desert, mosques, Andalusian architecture, probably the oldest extant Jewish community in the world, sophisticated resorts, camel rides, jeep excursions, weavers, and traditional musicians. And for one dollar you get 1.3 Tunisian dinars, which means your money will go far. 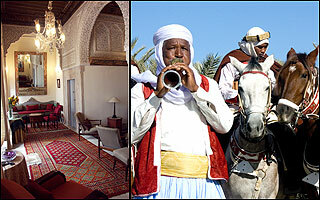 Tunis, the capital city, is a destination in itself or a great place to start a trip through Tunisia. HOW TO GET THERE Find the best flight deal you can to most any major European capital, and from there it's a two- to three-hour flight to the Tunis-Carthage Airport on Air France, Alitalia, British Airways, and Tunisair. Once you're in Tunis, you can easily get around the city by cab. To go elsewhere in the country, you may want to rent a car or, even better, a car with a driver. WHERE TO STAY Tunis's medina, or old city, founded in the seventh century, is a warren of labyrinthine streets that pulse with life and excitement. Visitors will witness a mind-bending melange of locals in djellabas and chechias (traditional robes and round felt hats), teenagers in the latest Western gear, calls to prayer from the Great Mosque, people of every age on cellphones, ancient palaces that are now private residences, and the smell of fresh bread, spices, and honey-drenched pastries. Until now, visitors could wander through the medina by day, but at night they had to taxi to hotels in the modern part of the city. Dar El Medina (011-216-71-563-022, www.darelmedina.com), which opened last year, has changed all that. The Belahouane family has transformed its 18th-century ancestral house into a 12-room "hotel de charme" - a cozy historic inn with intricate plaster friezes, multihued tiles, antique carpets, winding staircases, and a cafe. Double rooms start at $132. Upon your arrival, one of the Belahouane brothers, Salah or Mustapha, will likely lead you into the intimate and ornate salon, telling you it used to be his parents' bedroom and pointing to where their bed stood. WHAT TO DO Within a few blocks of the hotel are several mosques, the mausoleum of Sidi Ben Arous, and the Dar Ben Abdallah Museum of Traditional Arts and Customs. And the heart of the medina is the souks, markets where glimmering gold and sparkling silver objets vie for your attention with ceramics, leathers, and mounds of spices. Rug mavens head for Ed Dar (8 Rue Sidi Ben Arous, 011-216-71-561-732), where the rooms of the old family house are stacked with hundreds of rugs. One of the three brothers will greet you warmly and offer you tea. Carpets will be rolled out before you by his assistant. If you express interest in a carpet from Kairouan or a tribal rug or a kilim, a round of low-key bargaining will begin. The brothers are known for their honesty and fair prices. For a few dollars, you can take a cab to some of the highlights of Tunis and its environs: the Bardo Museum (with perhaps the finest Roman mosaics in the world), Sidi Bou Said (a village with cobblestone streets, whitewashed houses dripping with purple bougainvillea, and trendy cafes), and the ruins of ancient Carthage. WHERE TO EAT Two of the best traditional Tunisian restaurants in the country, open for lunch and dinner, are within walking distance of the Dar El Medina hotel. At Essaraya (011-216-71-560-310 for reservations, www.essarayatunis.com), patrons dine in the courtyard of a house built in 1700. The menu offers fabulous concoctions with meat or seafood, including Tunisian specialties like brik (egg in a fried pastry shell) and tajines (quiches); desserts include sweet grain puddings and myriad pastries. The elegant Dar El Jeld (011-216-71-560-916 for reservations, www.dareljelb.tourism. tn), which housed an important 19th-century family, features haute Tunisian cuisine, a sommelier trained in France, and a chickpea-and-honey dessert called "girls' hair pastry." - J.F. WHY IT'S A DEAL The spectacular red-rock scenery is free, and hiking, biking, and picnicking sites are abundant (a one-week pass to the Coconino National Forest costs $15 per carload, and entrance to Arizona state parks runs from $3 to $10 per carload per day). Sedona offers plenty to occupy families with children for a long weekend or more, and in one place you can experience the charm of the Old West, the new age, and the Native Americans who once peopled the area. HOW TO GET THERE JetBlue flies direct from Logan to Phoenix (recently as low as $258 round trip), and Southwest offers nonstop flights from Providence to Phoenix (as low as $218 round trip). In Phoenix, rent a car - it's an hour and a half or less to Sedona, depending on traffic. WHERE TO STAY The best option for families with children in Uptown Sedona is the Best Western Arroyo Roble Creekside Villas (800-773-3662, bestwesternsedona.com), within easy walking distance of shops, restaurants, and art galleries. It's close enough to Oak Creek to hear the ducks splashing, and the kids can wade in the water. The price - $329 a night, with a 12 percent discount for AAA or AARP members - isn't cheap, but you get a lot of space and amenities: Each rustic unit features two bedrooms (sleeping up to six), 21/2 baths, a full kitchen, a living and dining room area, a whirlpool tub, two fireplaces, access to recreational facilities (like pools, a sauna/steam room, and racquetball court), and free continental breakfast. Less luxurious accommodations in Uptown Sedona can be found at the Matterhorn Inn (800-372-8207, matterhorninn.com) for as low as $79 a night for a double room. WHAT TO DO The Out of Africa Wildlife Park (928-567-2842, outofafricapark.com), which opened last year in Camp Verde, near Sedona, after relocating from Scottsdale, is about as close as you can get to a safari in America. More than 400 wild animals live and roam over 104 acres, and there are three touring options. If you go on a Wednesday, Friday, or Sunday, you can do all three. The Serengeti Safari tour takes you to a direct encounter with the hoofed animals of the African plains in a small, open Mercedes Unimog. Expect to drive alongside wildebeest, zebra, and blesbok that graze and roam freely; a hungry giraffe may stick out its long tongue and will gladly eat biscuits from your hand. For the Wildlife Preserve tour, you board a tram or trolley that takes you into a world of tigers, lions, panthers, bears, hyenas, and wolves, where the large predators prowl and their eyes follow you around. The third tour is the Predator Feed, where you accompany burly workers as they hurl slabs of chicken, beef, and horse to the hungry beasts. On each tour, the park's owners, who act as guides, dispense fascinating information about animal behavior and cater to children. They may invite your kids to inch up to a safe distance from the big cats. 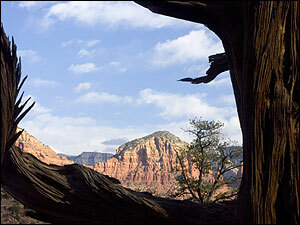 The Wildlife Park is a 30-minute drive from Sedona. It's a full day's entertainment that costs $28 for adults, $26 for seniors, and $20 for children up to 12 years, and is free for children under 3. Sedona is also a magnet for spiritual seekers, and even if you're not a believer, it's worth checking out at least one such attraction. The area's original inhabitants, the Sinagua Indians, regarded Sedona as a special place and reserved certain canyons for sacred ceremonies. Many residents and visitors believe you can still experience the energy that the Sinagua felt in so-called vortexes. Many of these vortexes are located on US Forest Service Land. Stop by the Chamber of Commerce Visitor Center (331 Forest Road, 800-288-7336, visitsedona.com) for a vortex map, or take a jeep tour to these special areas. For a native connection, take a short drive and an easy hike to the Honanki and Palatki ruins or visit V-Bar-V Ranch (928-282-4119, redrockcountry .org/recreation/cultural) to see more than 1,000 anthropomorphic, zoomorphic, and geometric petroglyphs that were carved into the rocks by ancient and prehistoric peoples. Montezuma Well (928-567-3322, nps.gov/moca /home.htm) was the site of an agricultural community of the Sinagua Indians, whose presence is evoked by the ruins, irrigation ditches, and funnel-shaped limestone sinkhole. WHERE TO EAT Inexpensive, casual places to take the family include Cafe Jose (928-282-0299), where the locals go for breakfast and home-style Mexican food, Wildflower Bread Company (928-204-2223, wildflower-bread.com), which offers gourmet soups, salads, and artisan breads, and the Coffee Pot Restaurant (928-282-6626), which serves breakfast until its mid-afternoon closing and is famous for its 101 omelets. - J.F. WHY IT'S A DEAL Fall foliage is not restricted to the borders of New England - venture into New York, and you'll quickly see why its state tree is the same sugar maple as neighboring Vermont's. One of the finer ways to appreciate the reds, yellows, and oranges blanketing the hillsides is a fall drive, so you can pull over for a little hike in the mountains or a paddle on a pond. Maybe even check out a regional museum to learn a thing or two. In New York's Adirondack North Country, 14 federal- and state-designated Scenic Byways traverse the region, offering more than enough road to see the sights or steer away from the leaf-peeping crowds. The Adirondacks is also a budget-conscious choice, a poor man's Vermont, where, instead of manicured village greens and white steeples, you encounter a rugged wilderness the size of Yellowstone, Glacier, Grand Canyon, and Everglades national parks combined. HOW TO GET THERE Take the Mass. Pike and continue on Interstate 90 into New York. Near Albany, take Interstate 787 north to I-87, known as the Northway. Take Exit 23, in Warrensburg, about a 31/2-hour drive from Boston. The following loop through the Adirondacks takes you on four Scenic Byways: Follow Route 28 west to Route 30 north to reach Blue Mountain Lake. Stay on Route 30 north to get to Long Lake and Tupper Lake. Continue on Route 30 to reach the St. Regis Wilderness Canoe Area, or take Route 3 to Saranac Lake, then Route 86 through the Olympic village of Lake Placid. Last, Route 73 east from Lake Placid will bring you to Keene, the gateway to the High Peaks region, where trailheads lead to the tallest mountains in the state. Continue on Route 73 to take you back to I-87. WHERE TO STAY Nestled on the shores of Blue Mountain Lake, the 17 units at Prospect Point Cottages (518-352-7378, prospectpt.com) come with a kitchen and patio. After Columbus Day weekend, you can stay three nights for the price of two. Cottages start at $105 a night. The Timber Lodge on Tupper Lake (518-359-2320, thetimberlodge.com) was recently purchased and renovated with handcrafted Adirondack furniture. Rates start at a reasonable $55 per night. Many hikers choose to stay at the Adirondak Loj (518-523-3441, adk.org/ad_loj/), a rustic retreat built by the Adirondack Mountain Club, in the High Peaks region, near Keene. It's not uncommon to run into "46ers" here, climbers who have bagged all 46 mountains over 4,000 feet in the Adirondacks. The Loj offers bunk beds at $40 per night, including breakfast. An additional $15 will get you dinner around a community table. WHAT TO DO First stop is the Adirondack Museum (518-352-7311, adirondackmuseum.org), where admission is $15. Enter the grounds on a hillside overlooking Blue Mountain Lake, and you can still find part of a log hotel built on this site in 1876. In the Boats Building, birch-bark canoes and guide boats dating to the 1840s are on display. The guide boats are indigenous to the Adirondacks, designed for an environment of small ponds and narrow, winding creeks. On October 7 and 8, the museum is hosting the Adirondack Harvest Festival, complete with a demonstration of a century-old cider press, folk music, and hayrides. 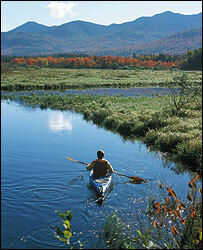 Viewing all those boats might give you the inspiration to ply the Adirondack waterways. North of Tupper Lake off Route 30, St. Regis Canoe Outfitters (888-775-2925, canoeoutfitters.com) rents canoes and will design routes along a mix of ponds, streams, and lakes. Even if you don't stay at the Adirondak Loj, take the hourlong climb from behind the cabin to the summit of Mount Jo. The trail snakes through a shaded forest of birch and pine trees before traversing boulders to reach the peak. The vista is your reward, with views of Mount Marcy (5,344 feet) above and Heart Lake below. WHERE TO EAT Known to some locals as P.J. 's, the Lake Placid Pub & Brewery (518-523-3813, ubuale.com) creates its own refreshing lagers and ales, perfect for washing down a plate of nachos and a dessert of s'mores. Keene's Baxter Mountain Tavern (518-576-9990) is another popular local hangout. Some of the dishes are named after the owner's grandparents; try the Sheasby chicken, with a side of creamy garlic mashed potatoes. - S.J. HOW TO GET THERE Drive to Portland or Bar Harbor, Maine, and board The Cat High Speed Car Ferry (877-359-3760, catferry.com) to Yarmouth, Nova Scotia. In this case, the journey is half the fun. Not only do you get to drive through New England at its most beautiful, but the ferryboat feels like a cruise ship. Onboard is a casino, cafe, bar, sports-television room, movie lounges, lots of comfortable seating, and pursers who will fetch board games for you. Off -season rates begin Monday. WHERE TO STAY You may want to spend a night in Yarmouth after getting off the ferry, but if you're game, drive the 1 1/2 hours to Lunenberg, which is about as picturesque a fishing village as you can find. Colorful homes hung with buoys dot the harbor, and the little shops beckon. If you're off the ferry early enough, make the three-hour drive to Halifax, a must-visit for travelers to Nova Scotia. Stay at the majestic The Lord Nelson (800-565-2020, lordnelsonhotel.com), a hotel near Halifax's historic public gardens and a 10-minute walk to the waterfront and the Halifax Citadel. Several package deals are available; for example, you can get a double-occupancy room starting at about $170 a night this fall and included are free parking and one gift certificate worth 50 Canadian dollars to spend in the nearby Spring Garden shopping district. Next, drive up Route 102 to the Trans-Canada Highway 104 and Cape Breton, where the scenery is by turns pastoral and wild and craggy. In the Ingonish area, stay at the Keltic Lodge Resort and Spa (800-565-0444, signatureresorts.com), high on a bluff overlooking the Atlantic. Rooms are about half-price now, and several packages are available: From October 10 to October 21 (when the resort closes for the season), a spa deal for about $143 per person per night includes lodging and a spa credit worth 100 Canadian dollars, while a golf package from about $98 per person per night includes lodging and one round of golf at the nearby Highlands Links. Even if you don't stay at the Keltic Lodge, consider visiting this gorgeous 18-hole, par-72 course designed in 1939 by the noted Stanley Thompson. WHAT TO DO Take advantage of the stronger US dollar by shopping at the cute boutiques in Halifax, but don't miss two historical detours. At the Halifax Citadel (902-426-5080, pc.gc.ca), a star-shaped fort on a hill completed in 1856, the powder magazine and soldiers' barracks are especially impressive; tickets are discounted in the off -season. At the waterfront's Maritime Museum of the Atlantic (902-424-7490, museum.gov.ns.ca/mma), you'll see relics from the Titanic and artifacts from the great explosion of 1917, when much of the city of Halifax burned. You probably know that Nova Scotia still thanks Boston for its aid by sending the city a giant holiday tree each year. 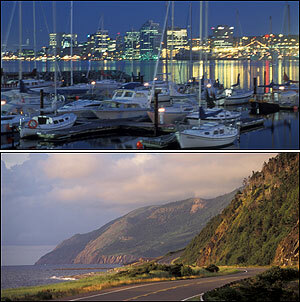 In Cape Breton, take a drive along the Cabot Trail, surely one of the most scenic ribbons of highway in North America. Sheer cliff s reach to red-sand and clay beaches on one side, while green mountains fold into gulches on the other. Take a short hike through the old-growth forest of the Cape Breton Highlands National Park (902-224-2306, pc.gc.ca) and over the soft carpet of pine needles and moss. The Lone Shieling trail offers a half-mile loop through a forest of 350-year-old sugar maples, passing a replica of a Scottish crofter's hut. If it's chilly, you'll be more protected here. On a sunny afternoon, for a more strenuous hike, take the 6.6-mile Coastal trail with scenic ocean views. WHERE TO EAT The best options in Halifax are Murphy's on the Water (902-420-1015, murphysonthewater.com) on Cable Wharf and Salty's (902-423-6818, www.saltys.ca) on Privateers Wharf. Both waterfront restaurants offer great views. At Salty's, try the seafood chowder with salmon, shrimp, and haddock and the fish and chips. For authentic Cape Breton cuisine, book a dinner at the Normaway Inn and Cabins (800-565-9463, normaway.com) in Margaree Valley. There you'll feast on vegetables grown in the chef 's garden as well as salmon caught from local streams. Before going for a hike in the Highlands National Park, stop in the community of Cheticamp and visit Boulangerie Aucoin (902-224-3220), where you can stock up on baked goodies - the molasses cookies are a specialty. - J.O. WHY IT'S A DEAL Usually you have to schlep halfway around the world to experience a truly exotic country, but Guatemala is so close you can have bagels in Boston in the morning and chicken pepian stew in Antigua for dinner. The cobblestone streets of the sumptuous Spanish colonial city are made for walking, and to visit the surrounding countryside, inexpensive private or group tours offered by many local travel agencies make a car unnecessary. For $13 per half-hour, enjoy a horse-drawn carriage ride through the city. Or, for a total-immersion experience that costs less than a dollar, hop on a local "chicken bus" and practice your Spanish. Guatemalan crafts and textiles - which are irresistible because of their dazzling colors - are for sale in boutiques, but if you're good at bargaining, you'll beat those prices by shopping at the outdoor handicraft market. HOW TO GET THERE Major airlines fly from Boston to Guatemala City with one stopover; look for round-trip tickets for around $500. A cab ride from the Guatemala City airport to Antigua takes less than an hour and costs from $25 to $45. WHERE TO STAY If you go to a Spanish-language school (see below), it can arrange a family stay for you for about $85 per week, including meals. For luxurious accommodations, Casa Santo Domingo (502-7820-1222, casasantodomingo.com.gt), a converted monastery and one of the finest hotels in the country, offers standard rooms starting at $170, single or double occupancy (and does not include the 22 percent tax). On the grounds of the hotel are four museums and an active archeological dig; the $5.50 admission fee is waived if you are a hotel guest. WHAT TO DO The main sites in Antigua include the l6th-century San Francisco Church (don't miss the tomb of St. Hermano Pedro de San Jose de Betancurt, a 17th-century missionary who is said to heal people from the other side); La Merced, a Baroque-style yellow-and-white church that looks as sumptuous as a wedding cake; and the central Plaza, which is illuminated at night. More than 50 language schools operate in Antigua, making it ideal for vacationers who want to learn or improve their Spanish. One of the best, Christian Spanish Academy (011-502-7832-3922, learncsa.com), provides one-on-one instruction with a private tutor, four hours a day, five days a week, for $135 per week. The academy's travel agency, De Pe a Pa (depeapatours.com), offers hiking excursions to Pacaya, an active volcano an hour away (guided tours are $25 to $53 per person, which includes transportation and entrance fees). As you ascend the volcano, you'll see the burning lava. Adventurous folks hike right up to the crater. Other travel agencies in town feature the same trip, or you can go on your own by chicken bus. Antigua is in the highlands of Guatemala, where many Maya people live (roughly one-third of Guatemala's population is indigenous). 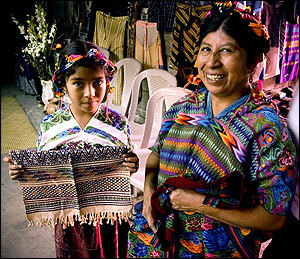 Many agencies offer trips to the Mayan village of San Antonio Aguas Calientes, a few miles southeast of Antigua, where a group of women teach you a few words in their native Cakchiquel language, dance, describe their culture, serve homemade specialties, and offer intricate, vividly colored blouses and textiles they have woven on back-strap looms. You can also go alone by chicken bus. For $6, a shuttle will pick you up at your hotel and take you to the coffee plantation La Azotea (011-502-7832-0809, centroazotea.com; click on "Finca La Azotea"). Once you've learned about the tender process of growing the "little soldiers" (baby one-leaf plants) and the "butterflies" (the two-leaf stage) through to maturity and harvest, you'll have a new respect for your morning cuppa. The owners of the coffee farm - Lilly and Viktor Pokorny - lived in Boston for 10 years. WHERE TO EAT La Fonda de la Calle Real (011-502-7832-7404) offers local specialties like pepian de pollo (stewed chicken with tomatoes, squash, greenbeans, and rice), white tamalitos (small tamales with corn puree inside), and subanick (a spicy dish with chicken, potatoes, pumpkin seeds, sesame, chile pimentos, and green tomatoes). Special chairs are reserved for clients Francis Ford Coppola and Ben Gazzara. Great Guatemalan and international food is served at Hotel Posada de Don Rodrigo (011-502-7832-0387), which features live marimba music and outdoor dining around a garden, while excellent steak and a trio playing traditional Guatemalan music can be found at Las Antorchas (011-502-7832-0806). The most romantic place to eat is El Sereno (011-502-7832-0501), a l6th-century mansion-turned-restaurant that offers, by request, private dining in a cave on the mansion grounds with flower petals strewn on the floor. The restaurant's terrace bar looks out over Antigua and three volcanoes. - J.F. WHY IT'S A DEAL Nashville is a never-ending surprise to those who still harbor the one-dimensional image of the city as the home of the country-music business. While it's certainly possible to while away the evening pickin' and grinnin' at the Grand Ole Opry House, it's just as possible to hear a first-class symphony orchestra or take in the art gallery at the full-scale replica of the Parthenon (complete with a 42-foot-tall gilded Athena). With a rental car, you can easily venture into the nearby countryside, where small towns celebrate fall's spectacular colors with festivals on almost every weekend from September through November. Best of all, you can pull off a long-weekend getaway on a shoestring budget. HOW TO GET THERE Recently, flights to Nashville from Boston have been priced as low as $208 round trip. You can get a better deal if you're willing to fly from Providence or Manchester instead of Logan Airport, or to take a flight with one stop. Delta flies direct from Boston to Nashville, while Southwest flies nonstop from Providence to Nashville. You'll need a car once you're there, so check airfare/car rental packages. WHERE TO STAY Because it's an entertainment-industry town, Nashville's hotels can be pricey. You'll find the best rates at name-brand franchises. The Hampton Inn and Suites Green Hills (615-777-0001, hamptoninn.com/hi/nash-greenhills) - in Green Hills, the city's noted shopping and dining neighborhood and near downtown and the Parthenon - offers nightly rates for two starting at $149. Breakfast and coffee are included. You can get rates as low as $90 per night, double occupancy, at chains like the Comfort Inn if you're willing to stay near the airport, which is about 10 minutes from downtown. WHAT TO DO Nashville is proud of its symphony orchestra, which attracts superior musicians who find the city appealing because they can play recording sessions on the side (and therefore make extra money). 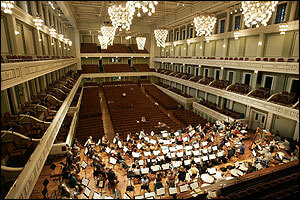 Now under the direction of Leonard Slatkin, the Nashville Symphony is housed in the brand-new Schermerhorn Symphony Center (615-687-6400, nashvillesymphony org). The center will host a free Day of Music on October 7, from 10 a.m. to midnight, with live music of all kinds, tours, and food. History buff s will want to visit at least one of the several 19th-century plantation houses that dot Nashville and the surrounding countryside. The best is the Hermitage (615-889-2941, thehermitage.com), the home of President Andrew Jackson, restored to look as it did in the 1800s. Visitors can tour the house and grounds by wagon through October or on foot any time. Admission is $12 for adults. As a bonus, after leaving the Hermitage, you will be close to the small town of Lebanon, Tennessee, which has a town square lined with antique shops that carry everything from barn-sale rescues to items that might show up on Antiques Roadshow. Fall is the state's high season for festivals, most of which are free or inexpensive. One standout is the Spring Hill Country Ham Festival (615-790-8202, countryhamfest.com) on October 7 at Rippavilla Plantation, a Civil War-era mansion and farm in Spring Hill, not far from Nashville. There will be ham-and-biscuit booths, hog-calling contests, live music by local bands, and an appearance by Wilbur, the new cover pig for the latest edition of Charlotte's Web. There is no admission fee, but parking is $5 per car. Another can't-miss event is the Goats, Music, and More Festival (866-964-6287, www.goatsmusicandmore.com) on October 13 and 14 in Lewisburg, Tennessee. About 50 miles south of Nashville, Lewisburg is the home of the renowned fainting goats - a muscle disorder causes them to fall down when startled. The city will celebrate the animals with live music, concessions, local crafts, and, of course, plenty of goats. Admission is free, but a parking donation is requested. For information about other festivals and events near Nashville, go to tnvacation.com. WHERE TO EAT To maximize your food dollar, do as many Nashvillians do and have your main meal at lunch. The city's Green Hills neighborhood is packed with cafes of all sorts, but for the real Nashville, search out a hometown favorite like Carolyn's Homestyle Kitchen (615-255-1008), located at 330 Charlotte Avenue downtown, where you can get great fried chicken and two vegetables, plus tea, for about $8 per person. There is no sign outside the restaurant - a sandwich board on the sidewalk is the signal that it's open. Another good bet is Jack's Bar-B-Que (615-254-5715, jacksbarbque.com), downtown at 416 Broadway, which serves your choice of pork shoulder, beef brisket, smoked turkey, sausage, ribs, or smoked chicken, as well as side vegetables, for less than $9 per person. - M.H. Not every vacation has to be planned months in advance. Winging it will help you stretch your dollar. Part of the fun of a vacation is the planning: reading up on your destination, shopping for the journey, and simply anticipating the trip. But if you're willing to forgo all that, you can score great deals by waiting until the last minute to book your travel. Planning a vacation in two weeks or less can save you 25 percent to 50 percent, and sometimes even 75 percent, on getaways like cruises. Last-minute vacationers aren't just retirees, says David Crooks, a vice president for National Leisure Group, the Woburn-based parent company of Vacation Outlet. They can be anyone with a free weekend, a desire to escape bad weather, or the willingness to be spontaneous. "The idea is to be flexible and not have your heart set on a specific place," says Tim Leffel, the Nashville-based author of Make Your Travel Dollars Worth a Fortune. Booking a week on the beach? You probably won't land at your first-choice resort. "But does it really matter if you go to the Dominican Republic or Jamaica or Mexico, if you're going to sit on the beach and drink cocktails?" he asks. Watch websites that specialize in last-minute travel. For example, site59.com offers weekend deals to US cities, including spots not usually considered tourist destinations. "These days," Leffel says, "almost any city has attractions worth seeing, especially if you're just going for a weekend." Cruises are ideal because many depart from Boston or New York, so they don't need to involve airfare. Last-minute passengers often can't choose the location of their cabin, Crooks says, but they'll otherwise get the same experience as full-price customers. Final advice from the experts: Don't expect to find great deals during peak travel periods, such as New Year's or school vacations. And make sure your passport is current, as applying for a new one can take six weeks. A new law effective January 8 requires that you carry passports for air and sea travel to destinations like Canada, the Caribbean, and Mexico. - E.O. If you've got an adventurous streak, these options are for you. COUCH SURFING Stay in the homes (or camp in the backyards) of people who agree to host you - for free. But couch surfing has loftier goals than just cheap travel. It's designed to foster cross-cultural understanding, so hosts and travelers share meals and socialize. Some groups don't charge for access to their host lists, but Servas International (servas.org), founded in 1948 to promote peace, requires travelers to pay $85 a year and be interviewed. Members carry an official letter of introduction, which they present at each home they visit. Kate Soukonnikov of Newton has played host and traveler though Servas since 1989 and says the system works. "I've never felt unsafe," the 53-year-old says, "even when I was single." Servas counts 15,000 hosts worldwide. Home stays last no more than two nights, unless you're invited to stay longer. HOUSE SWAPPING You and another person agree to trade homes (and often cars) for a set period of time, ranging from a long weekend to a month or more. No money changes hands (other than cash to cover land-line long-distance calls), says Karl Costabel, US representative for HomeLink International (homelink.org), founded in 1953 to connect potential home-exchangers. A one-year membership, which gives you a listing in HomeLink's online and paper directories, costs $80 and puts you in touch with the owners of 14,000 homes in about 65 countries. Renters can list their digs, too, but get the landlord's OK first. LABOR-FOR-LODGING In exchange for free or low-cost food and shelter, you provide sweat and elbow grease. Consider the volunteer trail vacations offered by the Appalachian Mountain Club (outdoors.org). Volunteer crews help AMC maintain hiking trails by clearing brush and building bridges, says Heather Clish, director of trails stewardship. Participants should be fit, but "you don't need to be an athletic superstar to join us," Clish says. You'll sleep in basic bunkhouses or camp outdoors, and a few trips require you to bring food, but you pay as little as $6 for some weekends and up to $150 for weeklong trips. This fall, AMC has a few remaining weekend programs - which are family friendly - in spots like New Hampshire's Cardigan Lodge. Weeklong trips resume in June. - E.O.